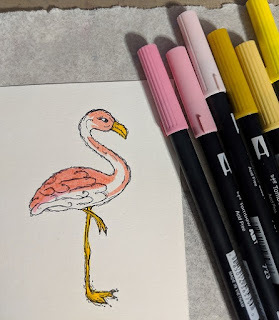 Today I would like to show you how I created a Flamingo card for the Under the Sea theme this month. I was a bit out of my element for the projects this month and I am not a big ocean/sea fan. I like to sit in my pool in the summer, fewer animals in my pool and no sand to drag into the house later! 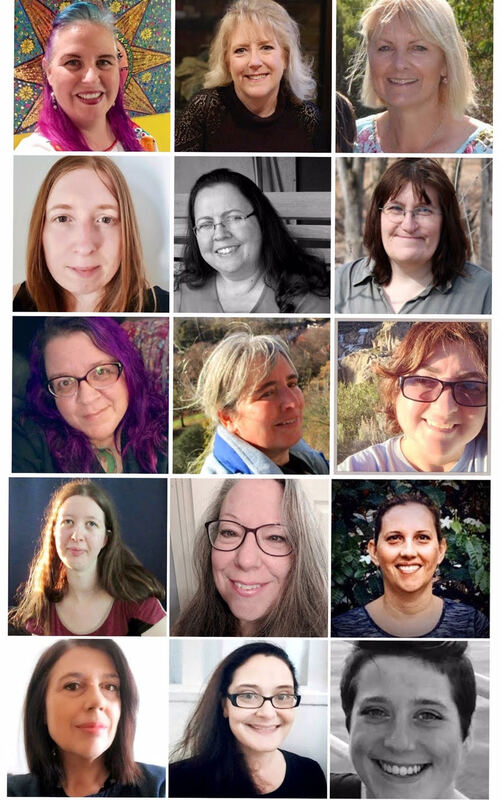 I work a lot of hours and I like to have time to create and not spending all my time cleaning house! 1. 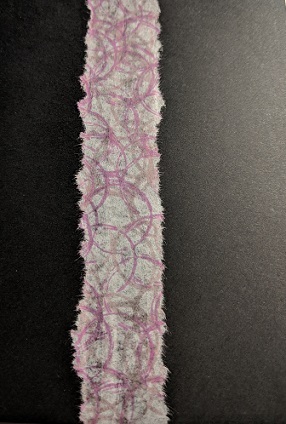 Using the different pink inks, stamp them randomly in a line on a piece of white tissue paper with stamps from the Background Grunge sheet and the Hearty Doodles sheet, then using the black ink, stamp the Open Weave Fishnet in a line on white tissue paper. I used the circles from the Background Grunge stamp and repeatedly stamped them over each other. 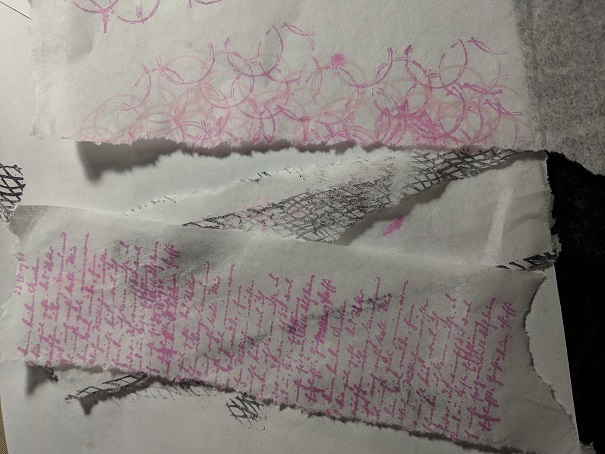 I used the script stamps from the Correspondence Pens sheet and stamped it in a line on the white tissue paper. 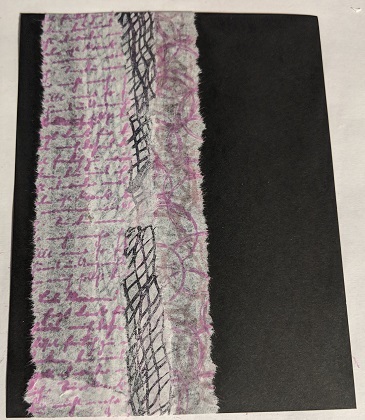 Quick tip - To tear the tissue paper, use a fine line brush with very little water and draw a line down the tissue paper, tear along this line to give you a nice torn edge. 2. Taking one of your stamped tissue pieces, glue it down about 2/3 from the edge of the black cardstock. Repeat with the other two layers. 3. Using the stamp platform, stamp the Flamingo several times onto watercolor paper then color the flamingo with markers. I used several colors over each other to get the effect I was looking for on the feathers. 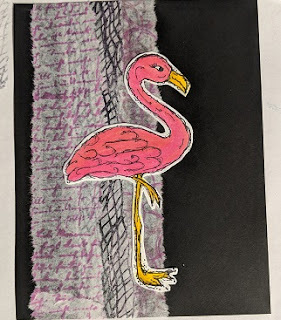 Then fussy cut the flamingo and glue it over the layered tissue paper. 4. 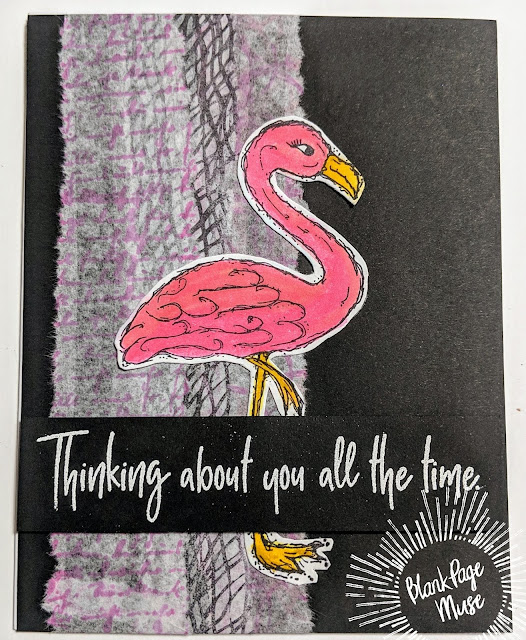 Next, using the Dear Beach sentiments the were cut apart, stamp in Versamark ink onto black cardstock and heat emboss with white embossing powder. 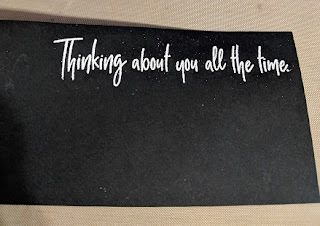 then trim down to fit across the card front. This card could be used for any occasion! Don’t forget to check out the stamps at Blank Page Muse. This flamingo is just impeccably colored Kelly!! I love how you used that background stamp too!